A delicious accompaniment to evening tea, these Coriander Vadai’s are simple and quick to make. 1. Grind the green chillies and garlic to a fine paste. 2. Mix the flour, coriander leaves, green chilli paste, turmeric powder, red chilli powder and cumin powder in a large bowl. 3. Add cumin seeds, sesame seeds and enough water. 4. Add a little water and 1 to 2 tsp of oil. 5. Mix well to form a thick batter. 6. Heat oil in a deep frying over medium flame. 7. Take a portion of the batter and flatten them lightly on your palms (or greased banana leaves). 8. Gently slide them into the hot oil and deep fry until light golden brown and crisp. 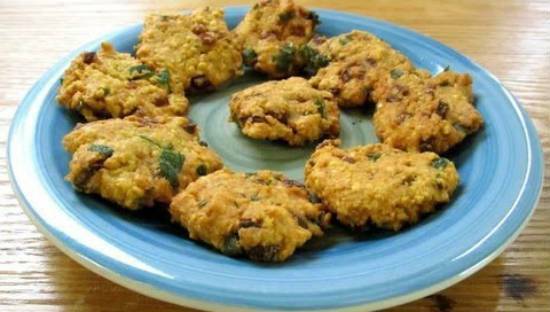 Feel free to comment or share your thoughts on this Coriander Vada Recipe from Awesome Cuisine.